What Are the Basics of an Ethernet LAN? Ethernet is the technology that is most commonly used in wired local area networks (LANs). A LAN is a network of computers and other electronic devices that covers a small area such as a room, office, or building. It is used in contrast to a wide area network (WAN), which spans much larger geographical areas. Ethernet is a network protocol that controls how data is transmitted over a LAN. Technically it is referred to as the IEEE 802.3 protocol. The protocol has evolved and improved over time to transfer data at the speed of a gigabit per second. Many people have used Ethernet technology their whole lives without knowing it. It is most likely that any wired network in your office, at the bank, and at home is an Ethernet LAN. Most desktop and laptop computers come with an integrated Ethernet card inside so they are ready to connect to an Ethernet LAN. Computers and devices to connect. Ethernet connects any computer or other electronic devices to its network as long as the device has an Ethernet adapter or network card. Network interface cards in the devices. A network interface card is either integrated into the motherboard of the computer or installed separately in the device. You also have USB versions of Ethernet cards such as external dongles. An Ethernet card is known as a network card. It has ports where you can connect cables. There are normally two ports, one for an RJ-45 jack that connects unshielded twisted pair (UTP) cables and one for a coaxial jack. A router, hub or gateway to connect your devices. 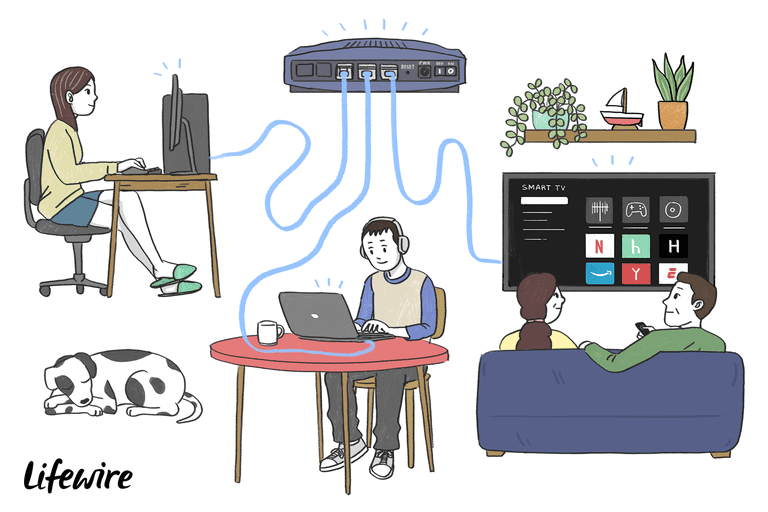 A hub is a device that acts as a connecting point between devices on a network. It consists of several RJ-45 ports to which you plug the cables. Cables. UTP cables are commonly used in Ethernet LANs. This is the same type of cable used for landline telephone sets, but fatter, with eight twisted pairs of wires of different colors inside. The end is crimped with an RJ-45 jack, which is a larger version of the RJ-11 jacks that plug into your landline phone. When the Ethernet spans beyond a room to a greater distance, coaxial cable is used. This is the same cable with a round single-core jack you use for a TV. Software to manage the network. Modern operating systems like recent versions of Windows, Linux and MacOS are more than sufficient to manage Ethernet LANs. Third-party software that gives more features and better control is available. Ethernet requires technical knowledge in computer science to understand the mechanism behind the Ethernet protocol fully. Here is a simple explanation: When a machine on the network wants to send data to another, it senses the carrier, which is the main wire connecting all the devices. If it is free, meaning no one is sending anything, it sends the data packet on the network, and all other devices check the packet to see whether they are the recipient. The recipient consumes the packet. If there is already a packet on the highway, the device that wants to send holds back for some thousandths of a second to try again until it can send.